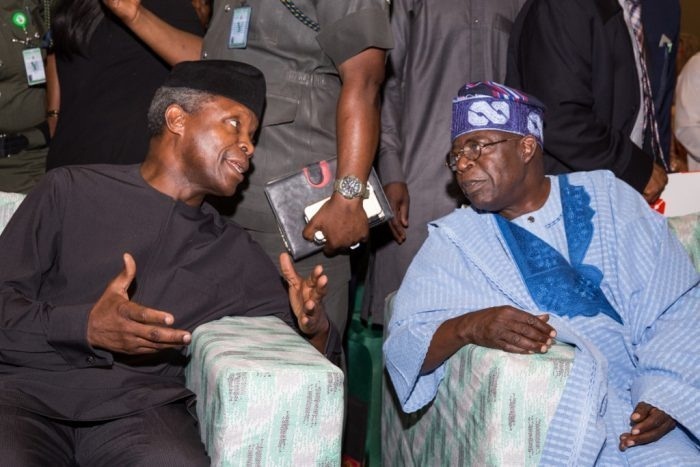 Vice President, Yemi Osinbajo, on Thursday hailed former governor of Lagos State, Bola Tinubu, for his doggedness over the years. He spoke at the 11th Bola Tinubu Colloquium held in Abuja. He described the event as a celebration of a man who has spent the last thirty years of his life in creative and catalytic public service. “He has from his days as Governor of Lagos State, provided clarity of thought and pioneering vision in all aspects of governance”, he said. “He is not a lawyer, but there are few Nigerians who have provoked so many legal controversies and constitutional challenges, resulting in several landmark judicial rulings, especially in the area of federalism, and what today is loosely described today as restructuring. “Many of us know, of course, that he is not an engineer, but a lot of his vision is what is responsible for what we see today in Lagos. The BRT, the Lekki Industrial Zone, even the Eko Atlantic Project, a private project which he initiated as governor of Lagos state and of course, the reform in the tax system in Lagos. “Today, Lagos earns more in Internally Generated Revenue than 31 States of Nigeria put together. That reform began in 2001with the very innovative way in which he reformed the tax system and created an independent system – the Lagos Inland Revenue Service. Several African countries and States of Nigeria have engaged the LIRS as consultants for their own reform efforts. “How about electoral reform? In 2007, when our party, then the ACN, was rigged out of the elections in Osun, Ekiti, Ondo and in Edo state, Asiwaju invited me to his residence at Bourdillion. He said to me that the only way by proving that there were multiple voting is by going through the courts, i.e. proving that a few people simply thumb printed the ballot papers, dumped them in ballot boxes and they were counted in favour of the opposition. “He then said to me that the only way we can do it is by somehow proving by forensic evidence that this is exactly what happened. I said to him that nobody has ever proved an electoral petition by forensic evidence; there is just no history of it. And I said what is, even more, is that there are over a million ballot papers, about 1.3 million ballot papers in all the States. So, how can you prove multiple voting? He said to me “Yemi, you have heard my view about this issue, just go and find a way of sorting this out. “So I went to the UK and met with possibly the most experienced finger print expert in the entire United Kingdom, a gentleman called Adrian Forty, introduced to me by some of the Queen’s Counsels. When I told him the enormity of the problem, he laughed and almost fell off his chair. He said in almost 50 years of his experience as a fingerprint expert, he hasn’t done up to 4000 fingerprints, and now we asked him to do 1.3million fingerprints. “We parted that day which was a Thursday, and then he got in touch again on a Monday and said we should discuss further. Somehow, we designed a way and used a bit of technology. Most importantly, we got the number of fingerprint experts that have never been assembled before, and we hired 63 of fingerprint experts. “50 of them were from the UK Police. What was more interesting about that is getting the UK Police to support us was for Asiwaju to come all the way from Nigeria to the UK to talk to friends and people who he knew, to persuade persuading the UK authorities to allowususe UK Police. “In the end, they allowed us to use the Policemen in their spare time. We got 63 policemen working flat out for almost 6 months. We were able to put together, for the first time in the history of elections tribunal in the history of the world, we put together a solid forensic case that showed all of the places we were defeated was on account of multiple thumb printing. “We also showed that for instance, you cast 20,000 votes, when we calculated the time to cast one vote, it is usually about 5 minutes but we discovered that our friends in the other political party were able to cast that number of votes in 5 seconds. All they were doing was simply thumb-printing booklets, as many as possible. “We demonstrated this in court, and one by one, we were able to get back the States that had been taken away from us. The only way that could have ever been achieved is surely not just by the vision, but by the determination of our leader at that time, the leader of the ACN. He showed the kind of leadership that was very rare and not only defining what he thought was thewayforward, but also supporting it in every way and backing it to the very end. “The last State that we finally won was Osun State, after almost 3 years of battling. One of the things that we would agree about our celebrant today is his dogged attitude and his refusal to accept no for an answer. “Asiwaju also pioneered merit in cabinet appointments in particular. I want to emphasize this because a major draw back we have, as a nation, is the way we are blindsided into thinking that we can avoid merit and expect to achieve great things. We simply cannot avoid merit. “Asiwaju demonstrated in the years when he was governor, that political appointments, especially cabinet appointments, should be based on merit. He looked for those that he considered the best possible material at the time regardless of where they were from. “For the first time in the history of Lagos State, we had cabinet members from other parts of the country, beginning with other parts of the Southwest. Rauf Aregbesola from Osun State, I from Ogun State, Arthur Worrey from Delta, Lai Mohammed from Kwara State, Dele Alake from Ekiti State, Ben Akabueze from Anambra State. “We also had the appointments of Judges from all over the country;JusticeOnyeabo, and Justice Sybil Nwaka were appointed Judges of Lagos State. There is no other State elsewhere in the country except in some places in the North, where we have seen the appointment of individuals from other States. Picking people for positions no matter what part of the country they are from is an important part of our story as a country.